From 17 June, a new display at the Royal Pavilion in Brighton will explore Jane Austen’s relationship with coastal towns and life in Brighton during her time, to mark the bicentenary of her death. Jane Austen by the Sea will look at the seaside context of Austen’s novels and letters and paint a picture of the fashionable seaside resorts in the late 18th and early 19th century. When I was asked to curate a display on one of the most important and influential writers in literary history, I was thrilled, especially as it was through literature that I fell in love with the English language and British culture in general. But how do turn the life and works of a witty, clever and eloquent, yet famously elusive and unpretentious female writer who lived 200 years ago, into a visually interesting exhibition? Austen left very few physical, tangible things when she died relatively young after a short illness in 1817, aged 41. Her legacy is predominantly in her words, her literary output: her four novels published during her lifetime, two further novels published just after her death, some highly entertaining juvenilia, an unfinished novel she was working on in 1817, and a wealth of letters, most of them to her beloved sister Cassandra, some to her publishers, nieces, brothers and a few other recipients. From these, it is clear that Austen loved sea-bathing, dancing, flirting, music, and many other amusements and entertainments associated with fashionable ‘watering places’. We decided to bring to life the atmosphere of seaside resorts through satirical prints, original costume from the period, maps, paintings and print ephemera. Austen appears never to have learnt to swim though, and, like many seaside visitors, relied on the help of a ‘dipper’, a strong person who would lower you into the shallow water, usually from the steps of a bathing machine that had been pulled into the sea by a donkey. In 1804 Austen caught a fever while staying in Lyme and decided to take to the bathing machines. She wrote to Cassandra, who was in Weymouth at the time: ‘I continue quite well, in proof of which I have bathed again this morning.’ It is likely that for Austen and other women sea-bathing was a form of physical enjoyment and even liberation. At times Austen even seems to have overindulged in dipping and sea-bathing. She reports in another letter: ‘The bathing was so delightful this morning and Molly [probably her dipper] so pressing me to enjoy myself that I stayed in rather too long, as since the middle of the day I have felt unreasonably tired. I shall be more careful tomorrow, as I had before intended.’ A manuscript in her sister’s hand of that unfinished novel, Sanditon, which is set in a fictional seaside resort on the Sussex coast (! ), will be on display at the Royal Pavilion, on loan from Jane Austen House Museum at Chawton. 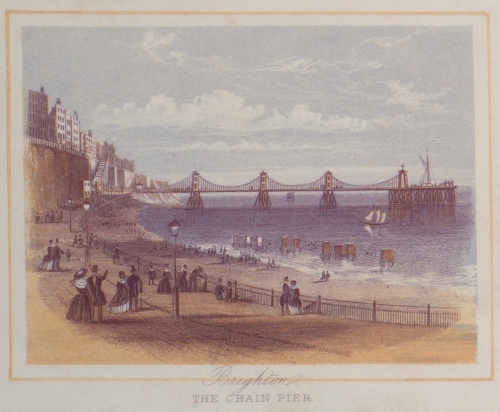 Although there is no clear evidence that Austen ever visited Brighton she included it in several of her works, alongside other resorts on England’s south coast. The display will reassess her relationship with the town in the light of a long-term misunderstanding, arising from a letter of 8 January 1799, where a place called Bookham was initially misread for ‘Brighton’. This mistake was repeatedly copied and cited; however, we now know that Austen may not have felt as negatively about the town as has been thought, and although she may have disapproved of some aspects of Brighton, the place was certainly a source of great inspiration for her. She decided to send some of her most silly and disreputable characters there, such as the flighty and fun-loving Lydia Bennet in Pride and Prejudice. George IV, who created Brighton’s Royal Pavilion and spent long periods living in the town when he was Prince Regent, was a high-profile fan of Austen’s – and although she didn’t approve of his lifestyle and how he treated his estranged wife, she was encouraged to dedicate Emma to him in 1815. In turn he kept a full set of her novels in each of his palaces, and Jane Austen by the Sea will present the King’s personal, specially-bound copy of Emma at the Royal Pavilion for the first time (generously lent by Her Majesty The Queen). This high-profile object will sit along some very personal things, such as a lock of Austen’s hair, probably cut off by her sister after her death and preserved in a locket, as well as several letters in her hand and a music book, into which she copied popular songs of the time.